I have been following them for years, from the shores of Marseille, to the airport of Singapore, through the snowy streets of Courchevel. 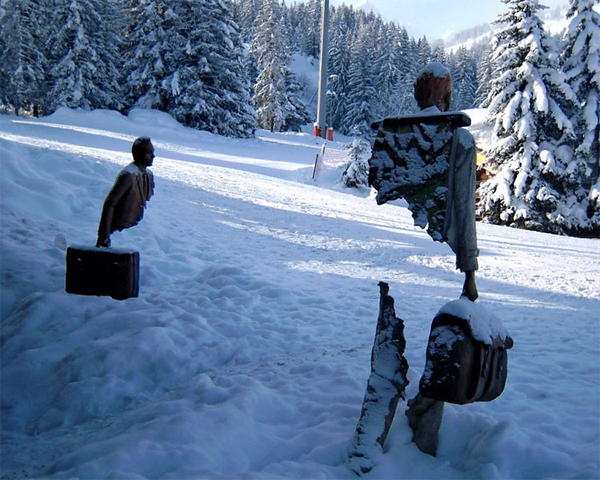 They are “the Voyageurs”, the sculptures of Bruno Catalano , ethereal creatures, fascinating in the mysterious relationship between empty and full, able to establish a dialogue with the surrounding world, to identify with it. They are migrants or nomads, having a suitcase in hand and a hope in the heart in search of a better life. They are as if they were “drilled” and perhaps reduced to pieces, as metaphorically the surrounding environment has made them. With an introspective look proceed unsteadily toward an unknown reality. These statues seem to have lost any vital organ. In this vacuum, paradoxically there is locked up everything, the whole world, the whole experience of those who have travelled and grew further in approaching and in conflict with the cultures of others. 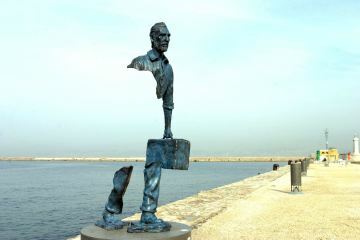 And who better than Bruno Catalano knows these circumstances. Marseille is his landing point, after living as a sailor for 30 years without a permanent home, navigating between the different ports of the world. And that is where he began his career: modelling clay firstly, then the casting in bronze. Inspired by the great masters such as Rodin, Giacometti, Camille Claudel and especially Bruno Lucchesi , who taught him the technique to model the clay, the sculptor manages to overcome the challenge of his predecessors, adding a fourth dimension in his attempt surrealist, well-managed, to create a vacuum in space. 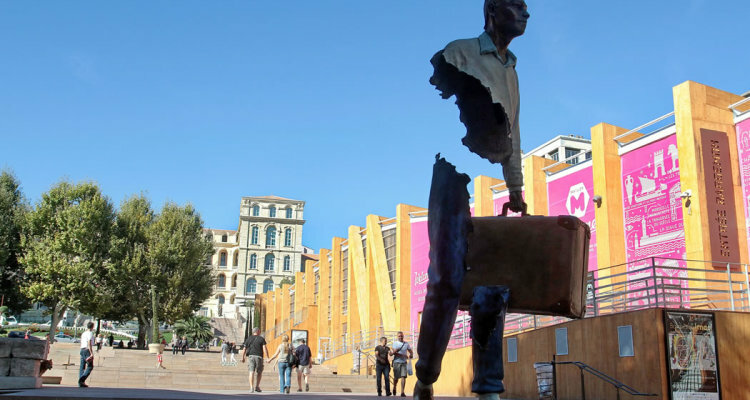 The sculptures by Bruno Catalano are grafted into the urban fabric; they are torn bodies in a space where you can see a view and different perspectives according to our imaginative capacities. I follow them as a kind of human migration, in different places of the world, where they are installed and not surprisingly these sculptural subjects are dwelling in places of transit, squares, airports, seaports. The most fascinating aspect is the angle that distorts the concept of “all-round” which we are accustomed to. 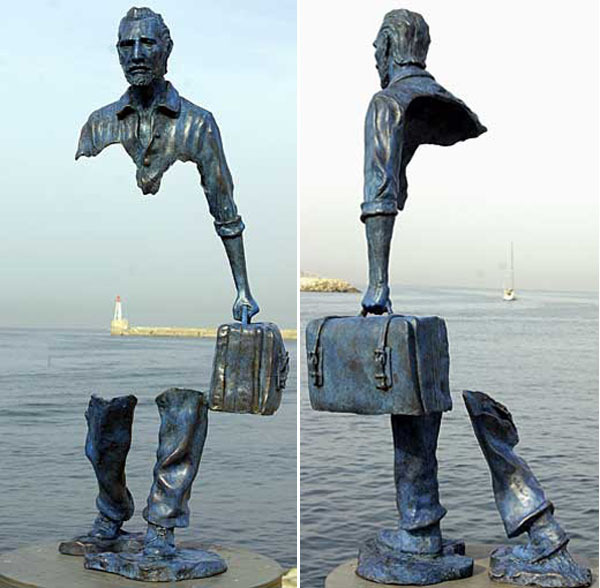 If classical statues can be seen from different points of view, turned around, and are always admired for the roundness of the forms, the sculptures of Bruno Catalano amplify, as in a dimension of sound, the concept of three-dimensionality in their lack of volume of forms, offering metaphorically the material world that surrounds them. In front of them could imagine how that body would be if it were provided with its missing parts. Particularly emblematic is the mono-chromatism of the medium used, as if the artist wanted to leave to the user more space for his imaginative capacity. What would be the colour of the skin of these solitaire travellers; which ethnic group would they belong to? We do not know if this lonely traveller has taken his course voluntarily towards an infinite horizon, that surrounds and hugs him, or if he was forced by exile and/or by sufferance in search of freedom or the instinct of survival. 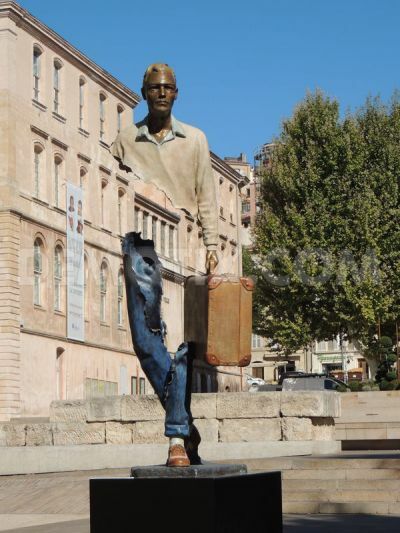 Bruno Catalano’s man does not belong to a single city, but he becomes a citizen of the world. His search for identity always involves some loss. His individualism is the result of compromises with the surrounding world, which has drilled in his roots. Is not it true that we leave a piece of ourselves, in our on-going migrating through the streets of the world, both as tourists and as seekers of identity? And for those who appreciate the beauty, traveling is just that: let us loose our way until we merge in harmony and in the wealth of the world and the sculptures of Bruno Catalano fully appear to represent this assumption.